"The enemy ... is racism. But see, racism isn't a person. It's a virus that infects people. It can infect whole towns and cities, even whole countries. Sometimes you can see it in people's faces when they're sick with it. It can paralyze even good people. It can paralyze government. We have to fight that wherever we find it. That's what good people do." After having heard from a number of people that they consider The Street Sweeper to be one of their all-time favorite novels (and because I am trying to put a dent into a number of unread novels from Australia I have laying around here) I started this book yesterday; with only a few breaks for eating, taking my puppies out, and answering the phone, the day became a marathon reading session that ended at 1 am this morning. It was an epic reading day for an epic novel. Even though there are several problems with this novel, overall I couldn't help but find myself extremely moved by it. "My friend is a black veteran who, among other things, served his country at the risk of his own life, liberating victims of one of the worst regimes that has ever existed, and ever since then people have been saying he wasn't there...This is what happened when the invisible man went to war!" "... it's a way of honoring those who came before us. We can tell their stories. Wouldn't you want someone to tell your story? Ultimately it's the best proof there is that we mattered." The author draws our attention to the " connections between things, people, places, ideas," and also spends time drawing parallels between African-American struggles against extreme forms of racism and those of European Jews. As just one example, did you know that African-American workers in Chicago slaughterhouses had black stars on their time cards making it easier for them to be identified when the layoffs came around? 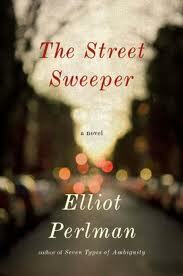 Although this is one of the most powerful books I've picked up in a while, The Street Sweeper is not without its faults. To mention a few, first it does take some time to figure out exactly where the author is going; it really wasn't until Lamont meets the elderly cancer patient that things started to pick up for me. Also, in trying to make the point about connections the author has relied on a contrived, systematic series of coincidences that you can't help but notice. There's also a lot that could have been weeded out of this novel such as the ongoing, in-Adam's-head discussions with his girlfriend Diana throughout the story, a number of storyline starts that aren't always finished, and some strange-sounding prose here and there (migrainous?). But while these sorts of things and others tend to set my teeth on edge, they can be somewhat forgiven because of the author's overall focus on people not just as players or victims caught up in historical events, but people as human beings with lives to be remembered and stories to be told. I feel this need to pace my reading about the Holocaust because of the emotional toll, and while you can't help but be moved by the powerful scenes that occur in the camps in this novel, there's a great deal more to this book that will keep you reading. As one of the characters notes, memory "can capture you, corner you or liberate you," and this idea is perhaps one of the strongest ideas that runs through this book when all is said and done -- that and the force behind oral history that keeps the past alive. The people may be gone, but the stories live on and need listeners, no matter if they're sad or inspiring. Aside from my issues mentioned above, I couldn't help but be very moved by this novel -- I was so utterly engrossed in it that all outside stimuli disappeared to the point where it was just me and the book for hours on end. I most definitely and highly recommend it. This is one of my favourite books of the year so I'm really pleased to see that you enjoyed it. Despite it being a favourite I agree that it has faults. I agree that it could probably have been edited down a bit and I agree that there were a few too many coincidences, but in the end it was so good I'm willing to forgive it. Glad you could too. It's highly unlike me in terms of forgiving so many things that make me cringe as a rule, but I must say, this book really got under my skin. At 1:30 am I'm sending emails to two of my friends telling them that they absolutely had to read this book! I meant to say at 1:30 this morning I was sending emails! I'm so tired, as you might well imagine. I forgave it all its faults too because it is one of the most moving and enveloping novels I have ever read. The memory theme was what moved it from commonplace to something truly special. I agree with that, Jo! jews, blacks and other races are so pure and innocent. Too bad that Nordic White people are so evil. dude, you have a serious problem. It's just a book. Get over yourself.